Serverpronto Review 2019: Is Serverpronto a Good Hosting? At ServerPronto, you can expect a high-quality service and get your money's worth. Their hardware is state-of-the-art and the management is well-qualified. ServerPronto is based in the U.S.A. and has been providing hosting services for over 15 years now. They serve customers in over ninety-nine countries with the help of their qualified and dedicated staff. To date, they have served over 10,000 customers. ServerPronto uses state-of-the-art equipment for its data centers and offers modern hardware to its users. This is what helps them ensure a 99.999% uptime for your websites. The multiple-tier 1 10GGbps backbone and up to 1Gbps server speeds ensure a reliable and trustworthy service for all customers. Their data center is SSAE-16 certified and features the latest security measures including DDoS mitigation. Their services are scalable which means if at any point you feel that your requirements exceed the specifications provided to you, you can easily upgrade your package. While many hosting providers promise unlimited bandwidth, most of them still give you limited or shared resources where you will eventually run into trouble as soon as someone takes up a lot of server resources. At ServerPronto, you can be guaranteed that if you asked for a dedicated server, you will be provided one, irrespective of whether your needs can be fulfilled with a shared server. 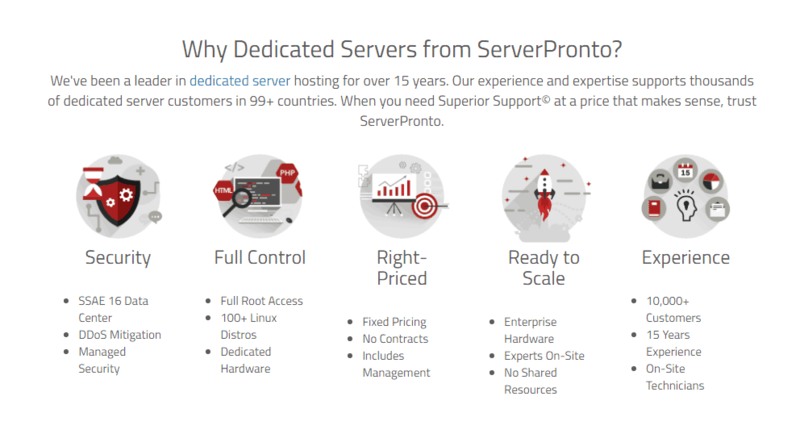 For an amazingly affordable price, ServerPronto offers a single package that should fulfill all your requirements. You get one cPanel hosting account containing 100GB of disk space and 500GB of bandwidth. Additionally, there are unlimited email accounts and databases at your disposal with a 100Mbos network Uplink. You can pay in advance for one, two, or three years and get a discount. As I opened their website, I was immediately greeted by a live chat option. I don’t like the fact that I have to give my email address to talk to them. But the support was great with the person directly answering my question without asking for any more information from me. You can also call them by telephone or message them through the contact form on the website. The chat and ticket support system are offered 24/7 while you can only reach them by phone during working hours. Their social media team is also quite competent. Whether you are looking to host your own websites or start your own website hosting business, ServerPronto has the right packages for your exact needs. Wondering how Serverpronto stacks up against other Web Hosting companies? Enter any other Web Hosting company and we will give you a side-by-side comparison.